Caravaggio (Michelangelo Merisi da Caravaggio) (1571–1610), Medusa (c 1597), oil on canvas mounted on wood, 60 x 55 cm, Galleria degli Uffizi, Florence. Wikimedia Commons. Having rescued Andromeda from the sea-monster Cetus, Perseus makes offerings to the gods, and prepares for his wedding to his newly-won bride. It is then, at his wedding feast, that Ovid has Perseus tell the story of his encounter with the Gorgon Medusa, which brings Book 4 of the Metamorphoses to a conclusion. Once Perseus has made appropriate thanks to the gods, he takes Andromeda to their wedding feast. As the Princess, this is celebrated in grand style in her parents’ palace. When the banquet is over, Perseus asks about the kingdom, and King Cepheus, his new father-in-law, asks Perseus how he acquired Medusa’s head. Perseus then gives a short and fairly detached account of how he beheaded Medusa. He first went to the two Graiae, the sisters who guarded Medusa, and stole the single eye which they shared between them. As they were then unable to keep watch, he travelled on to the land where Medusa lived. This was distinguished by abundant figures of animals and people who had been turned to stone by the sight of her face. From her blood which emerged, the winged horse Pegasus and his human brother Chrysaor were born. Perseus then gives a summary of his escape and flight around the world before discovering Andromeda in distress. those awful vipers — creatures of her rage. The image of Medusa shown on Minerva’s breastplate is known as her Aegis, and is one of her more obvious attributes. 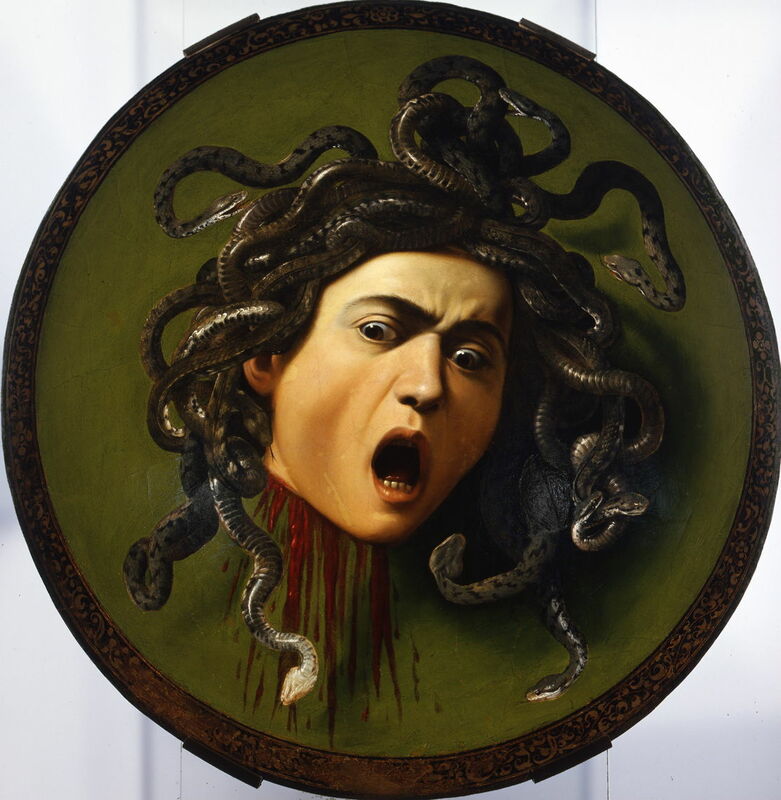 The head of Medusa has been a popular motif for painters across the ages, although how Perseus came to remove it seems to have had more limited appeal. I cannot find any painted account of how Medusa was transformed into a Gorgon, but will start with a selection of her portraits. The most famous of those is probably Caravaggio’s Medusa (c 1597), actually his second version, which is now in the Uffizi in Florence; the first is slightly smaller and is in a private collection. Unusually for Caravaggio, this was painted on a tondo. He follows traditional lines, with ample blood and abundant snakes, and captures the open-mouthed horror in the woman’s face. Peter Paul Rubens (1577–1640), The Head of Medusa (c 1617), oil on panel, 69 x 118 cm, Kunsthistorisches Museum, Vienna, Austria. Wikimedia Commons. Shortly afterwards, the young and flourishing Rubens painted his remarkable The Head of Medusa (c 1617). This most probably shows the head when Perseus had placed it on a bed of seaweed, when he had rescued Andromeda in the previous story. Rubens shows an exuberant mass of snakes, even a lizard and a scorpion, more of which appear to be forming in the blood exuding at the neck. Carlos Schwabe (1866–1926), Medusa (1895), watercolour on paper, dimensions not known, Private collection. Wikimedia Commons. Also noteworthy is Carlos Schwabe’s watercolour Medusa (1895), with its feline eyes and that characteristic wide-mouthed look of horror. 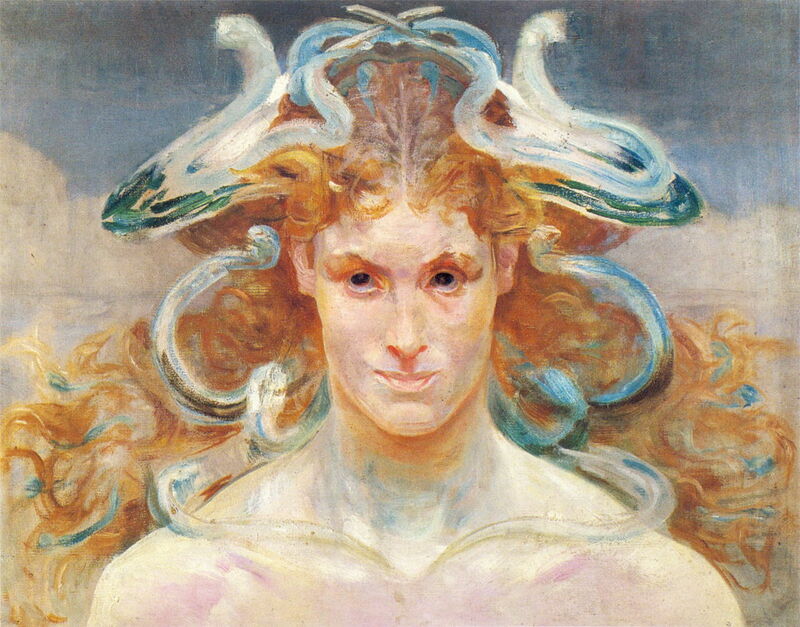 The great Polish artist Jacek Malczewski made Medusa a recurrent theme in his work. 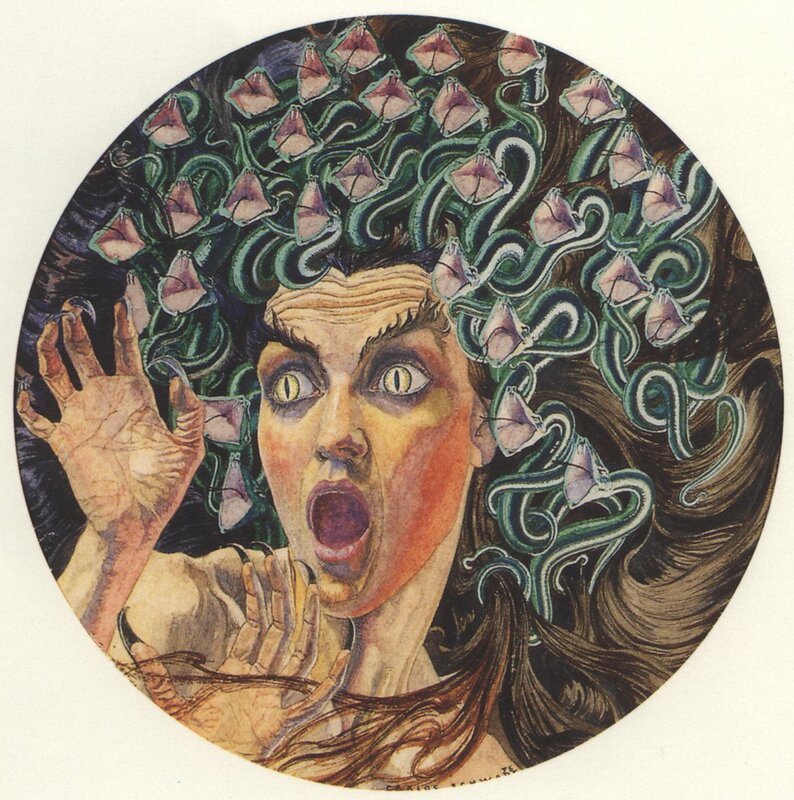 Here I show his Medusa (1900), above, in which the snakes adorning her hair curl and sweep in symmetry, amid more natural locks. 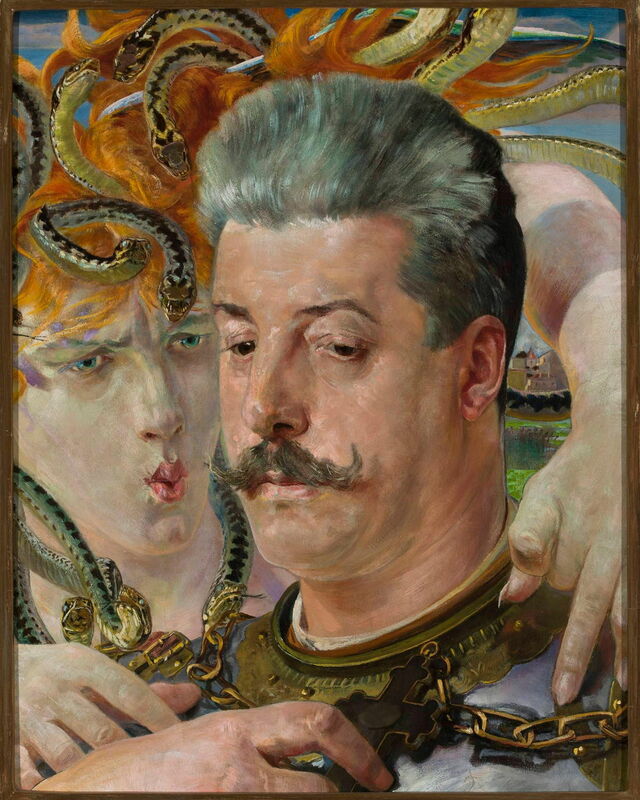 In his painting below, he pairs his sculptor friend with the Gorgon in this Portrait of Tadeusz Błotnicki with Medusa (1902). Baldassare Peruzzi (1481–1537), Perseus and Pegasus (1510-11), fresco, dimensions not known, Sala delle Prospettive, Villa Farnesina, Rome. Wikimedia Commons. Although Baldassare Peruzzi must have been very familiar with the story, his fresco in the Sala delle Prospettive of the Villa Farnesina in Rome takes a very liberal approach. Perhaps to simplify his composition and make the action more direct, Perseus does not view Medusa via her reflection in his shield, but in Perseus and Pegasus (1510-11) the hero looks straight at his victim. The white head of Pegasus, at the far right, was born from the blood spilt when Medusa was beheaded, so is later in time than the events at the left. 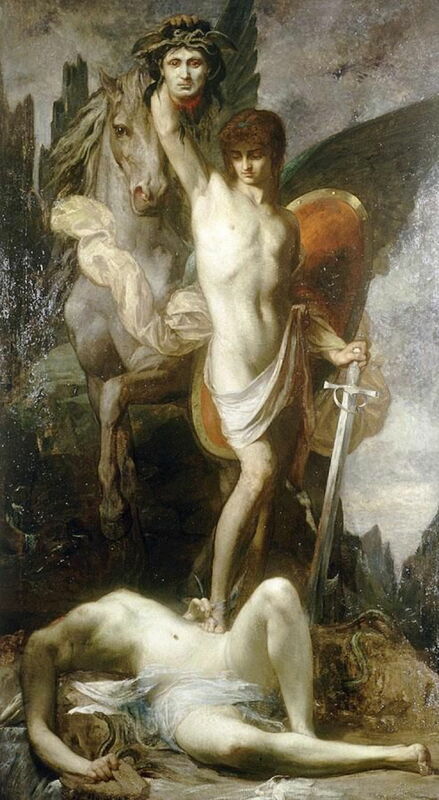 Eugène Romain Thirion (1839–1910), Perseus Victorious Over Medusa (1867), oil, dimensions not known, Private collection. Wikimedia Commons. Eugène Romain Thirion’s Perseus Victorious Over Medusa (1867) keeps to convention, with the hero holding Medusa’s head aloft, and facing away from him, in triumph. He shows Pegasus behind, but not Chrysaor, who is in general omitted from these paintings, and indeed from some verbal accounts. 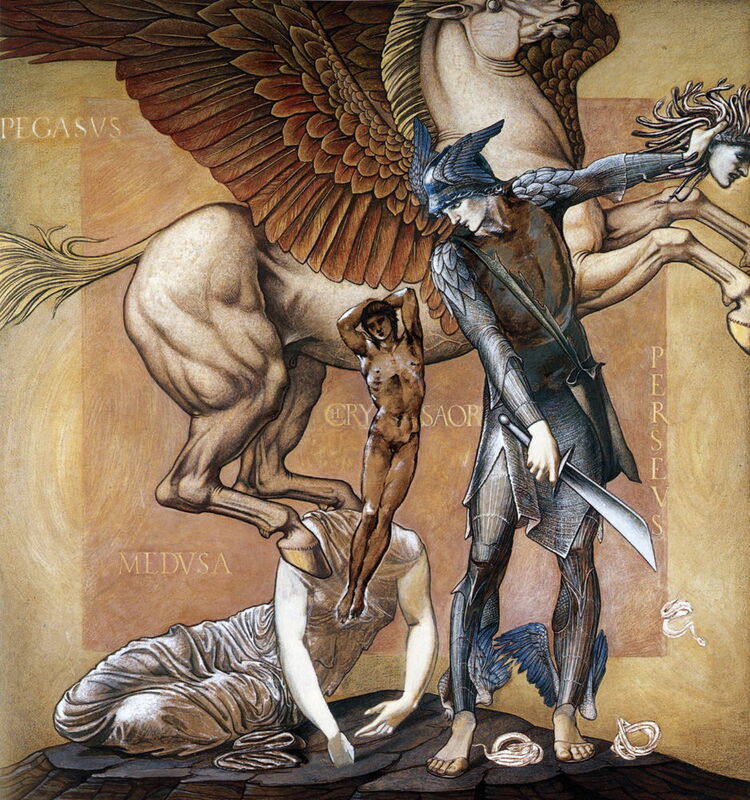 As with the rest of the story of Perseus, it is Edward Burne-Jones who provides the most complete and explicit account, in his studies for his Perseus series. 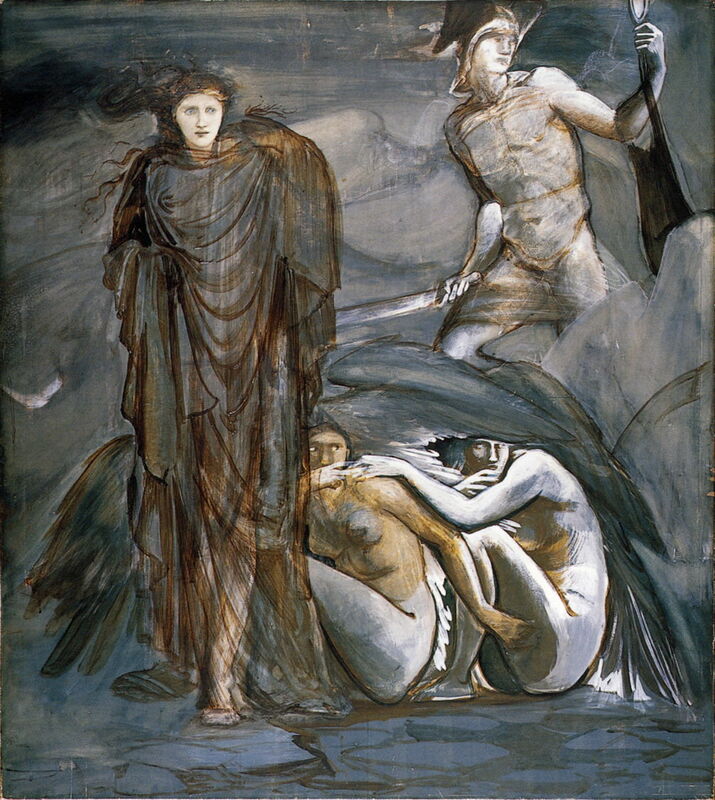 The fourth painting in the series, The Finding of Medusa (1882), progressed no further than the unfinished bodycolour study above. It shows Perseus, wearing the helmet of Hades for invisibility, brandishing his adamantine sword, and viewing the scene in his mirror, in the Gorgons’ cave. Medusa, her hair yet to be detailed into snakes, is stood with a fearsome expression, while her two immortal sisters are scrunched together under their wings. The fifth in the series, The Death of Medusa I (1882), was completed in bodycolour study but not in the final version in oils. Perseus has just cut Medusa’s head off, and holds it aloft with his left hand, at the far right edge of the painting. The adamantine sword is still in his right hand, and the kibisis is slung around his neck. Emerging from the severed neck, as if in collage, are Pegasus and Chrysaor, the latter shown as the associated person and without his characteristic curved golden sword. Three of the serpents from Medusa’s head have detached and fallen to the ground. The sixth in the series, The Death of Medusa II (1881-2), completes the story of Medusa, as Perseus flees from the Gorgons. 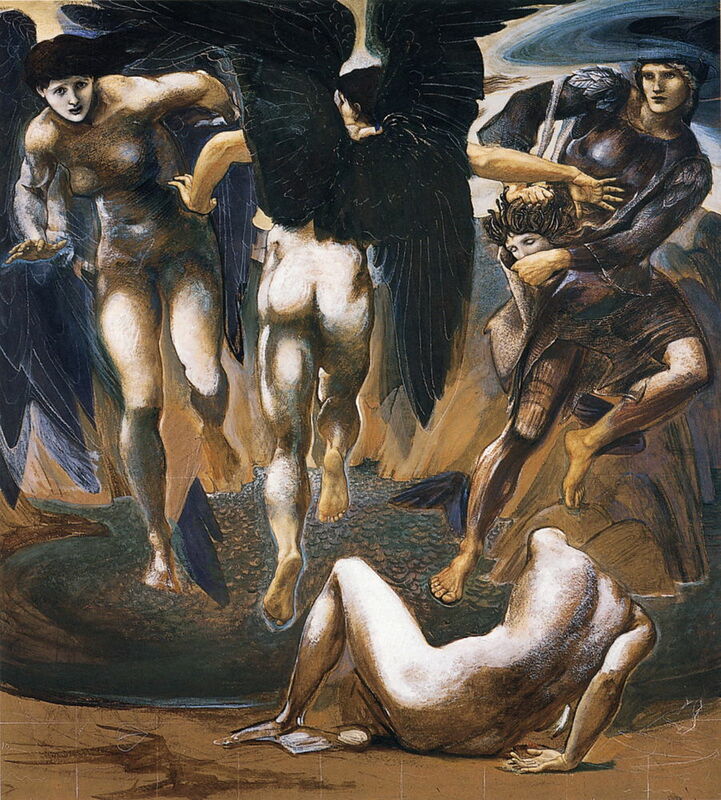 The headless body of Medusa is left on the ground, and her sisters fly around searching for her assailant. Perseus wears the helmet of Hades to maintain his invisibility, and is flying away with his winged sandals, while inserting Medusa’s head in the kibisis. This too was never realised in a final version painted in oils. Medusa and her death at the hands of Perseus have not only proved very popular with artists, but have inspired some superb paintings, right up to modern times. 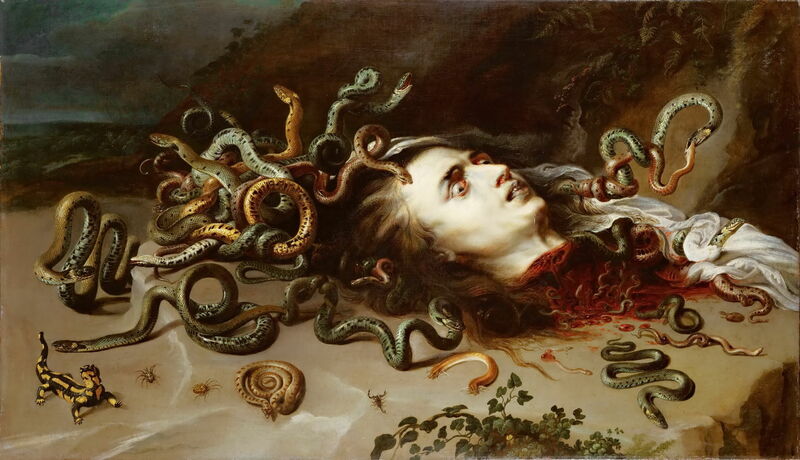 The image of Medusa’s snake-filled hair has extended even greater, and is one of the great visual tropes in Western art. And I think Perseus’ story must be one of the best wedding speeches ever. Posted in General, Language, Life, Painting and tagged Burne-Jones, Caravaggio, Malczewski, Medusa, Metamorphoses, myth, narrative, Ovid, painting, Perseus, Peruzzi, Rubens, Schwabe, Thirion. Bookmark the permalink.